It’s been a long, nostalgic winter of celebrating Whistler’s Golden Anniversary. But just as Whistler is known for deep snowpacks that sustain the snow-sliding revelry well past winter, we have an abundance of stories this year to push our regular Speaker Series programming well into spring. Considering the circumstances, it is only fitting that we prolong our season-long retrospective on our resort’s proud ski history with an event paying tribute to that seasonal oddity peculiar to Whistler, summer skiing. The evening of Friday May 6th we will be hosting a Speaker Series focused on fifty years of summer skiing camps on Whistler’s glaciers. Summer glacier skiing in Whistler is as old as the resort itself, having begun during the inaugural season of 1966. Beginning with the original Toni Sailer camps and later Dave Murray camps on Whistler, then moving to Blackcomb’s Horstman Glacier in the 1980s, with Camp of Champions, Momentum Camps, to name just a few, summer skiing in Whistler has been a novel way to compliment and extend the regular ski season, promote the resort with a veritable who’s who of celebrity athletes and guest coaches, and create fifty years of memorable and unique experiences. Former camper and ski history enthusiast Alex Douglas has organized a weekend long “Whistler Summer Camp Reunion” series of events, with this Speaker Series included. There will also be a reunion dinner hosted at Creekbread on the Saturday, and, of course, group ski outings during the day. One need not be a former camper to attend the Speaker Series event. 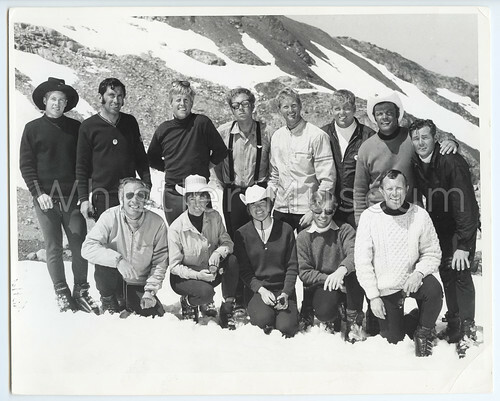 The crew from the 1969 Toni Sailer Summer Camp, including (front row at left) Alan White and Nancy Greene, and Toni Sailer himself (back row, 2nd from right). The Speaker Series will open with a screening of footage and a short film dating back to the original Toni Sailer Summer Camps of the 1960s and 70s. After the film will be a panel discussion featuring Canadian ski racing legend and former summer camp coach Nancy Greene-Raine, Alan White, founding manager of Toni Sailer camps and one of the true ski pioneers of Whistler, and former coach from the Dave Murray Summer Camp era, Mark Taylor. Needless to say, this is a wonderful panel of speakers and we are extremely excited to host them and hear their stories. A group shot of all the coaches at the Dave Murray Summer Ski Camp, circa late 1980s, including Mark Taylor (back row 4th from the left). The crew was a veritable “who’s who” of Canadian ski racing. Stephanie Sloan Photo. Doors will open at 6pm, with the presentations beginning at 7pm. Tickets are $10, $5 for museum members. To purchase tickets, stop by the Whistler Museum or call us at 604-932- 2019. To ensure a seat, make sure to purchase in advance as this event will sell out. As always, we will be serving complimentary coffee provided by the Whistler Roasting Company, assorted tea, and a cash bar serving beer and wine.